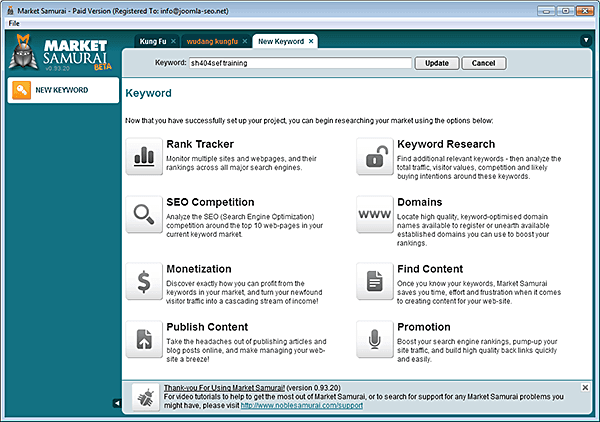 Market Samurai is an extremely popular tool for SEO agencies. Contrary to many other tools, it's a desktop tool. One of the reaons for being so popular: it's only a one-off fee ($149, or $97 for signup during the trial), so no recurring monthly fees. And even if you already have an account with tools like Raven, Moz or WebCEO, it still has it's own strong points, so you can use them next to each other. 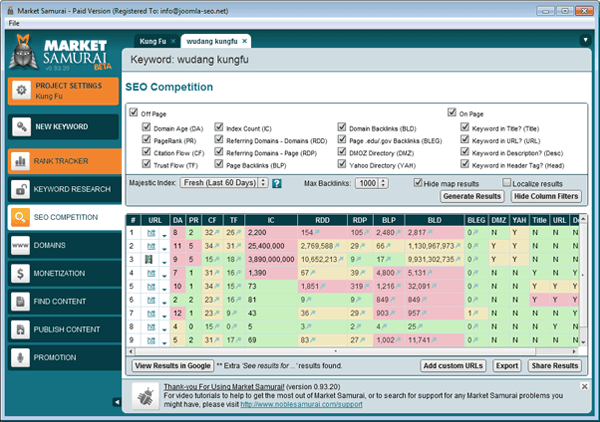 Market Samurai is particularly good at keyword analysis and checking out competition in Google, plus quite a few other features. You can check out a trial version of the tool for 12 days, allowing you access to all major features. 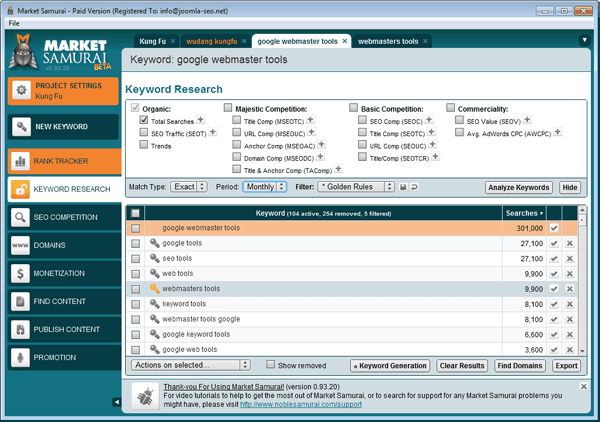 Analyzing keywords is one of the main reasons for many to use the tool. All data is actually pulled from Google AdWords, but the analysis and filtering options make Market Samurai quite a bit more user friendly. Start with one keyword, click Generate keywords, filter the list and then click Analyze keywords. This should give you a list with very useful information, all with filters, and options to link to external sources from within the results. From here, you can jump directly to the SEO Competition page, by clicking the little key-icon. From there you can check out your competition. Hovering over the table headers tells you what everything means. By now, you should have a fairly good idea of how easy to beat the top 10 is. Keeping track of your current rankings is always nice. In this, the tool is a bit limited, as it only allows you to track 10 keywords. More is possible, but then a subscription kicks in.... For $10 you can already follow a 100 keywords, so it's not too bad. These are probably the most useful features, though there are a few other tools built in that might be beneficial for some. The best is to try it out with the 12-day trial. That should be long enough for you to judge whether it is any good for your purposes. You can sign up here: Market Samurai free trial.